Sprint intervals are used by athletes to get into peak shape for races and team sports. Unlike long duration training, sprint intervals require you to use maximum effort. If you are trying to lose weight and have a busy schedule, you can get a great workout in a short amount of time. Sprint intervals also cause your metabolism to rise for several hours after you are done working out, which boosts your weight loss efforts even more. If you are new to sprint intervals, learn the basics and supplement them into your workout routine. Stretch your muscles dynamically before starting your workout. Dynamic stretches are performed in motion and they will help get your joints and muscles acclimated for the movement they are going to be doing. Perform shoulder shrugs, arm circles, leg swings, arm crossovers, alternating toe touches, ankle bounces, walking lunges, side bends and spinal rotations. Perform a light warm-up to increase your core body temperature and further loosen up your connective tissue. Walk at a fast pace for two to three minutes, then jog for five minutes. Run your intervals. Mark off a distance where you are running that is 40 to 50 yards long. After doing your warm-up, come to this location and sprint as hard as you can for the whole distance. 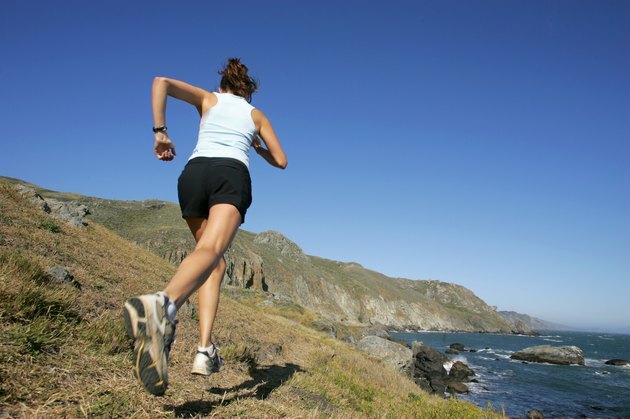 Jog back to your starting point and sprint again. Repeat this sequence five to six times. Wear a stop watch and time your sprints for a variation. Do your warm-up, sprint for 20 to 30 seconds and stop completely. Rest for a duration twice as long as your sprint. In this example, your rest breaks would be 40 to 60 seconds. Sprint again after your rest and repeat for five to six intervals. Utilize proper form when running. Lean forward slightly and push forcefully off the ground with the balls of your feet. Keep your elbows flexed 90 degrees throughout and do not tense your arms. Let them swing freely from your shoulders and keep them close to your body. Increase your reps as you adapt. Five to six intervals per training session is a good starting point. Increase your intervals as you build up strength and lung capacity. Get to a point where you can easily do 15 intervals per workout. Increase the duration of your sprints and decrease the duration of your recoveries to progress with your sprint training as well. Take at least one day off in between your sessions due to the intensity of sprinting, and do no more than three workouts a week. Vary your interval duration. Use a 1:3 to 1:5 ratio. For instance, if you sprint for 30 seconds, you should walk between 1 minute 30 seconds and 2 minutes 30 seconds. Sprint training is very intense. If you have not worked out in a long time, get clearance from your doctor before attempting it.